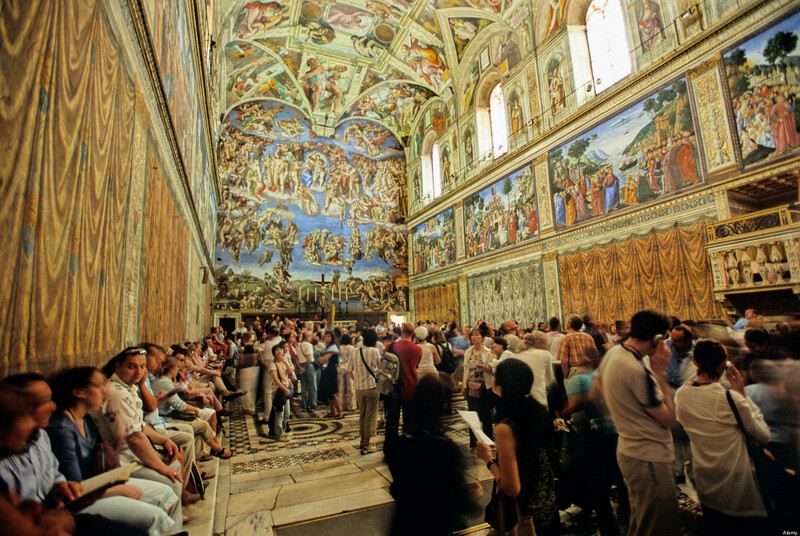 One of the most visited art museums in the world is the Vatican Museum. Just a fun fact before I share with you photos from this tour: Did you know that the Vatican City is the smallest country in the world? It is the spiritual and governing center of the Roman Catholic Church headed by the Pope who holds full legislative, executive and judicial powers of the state. 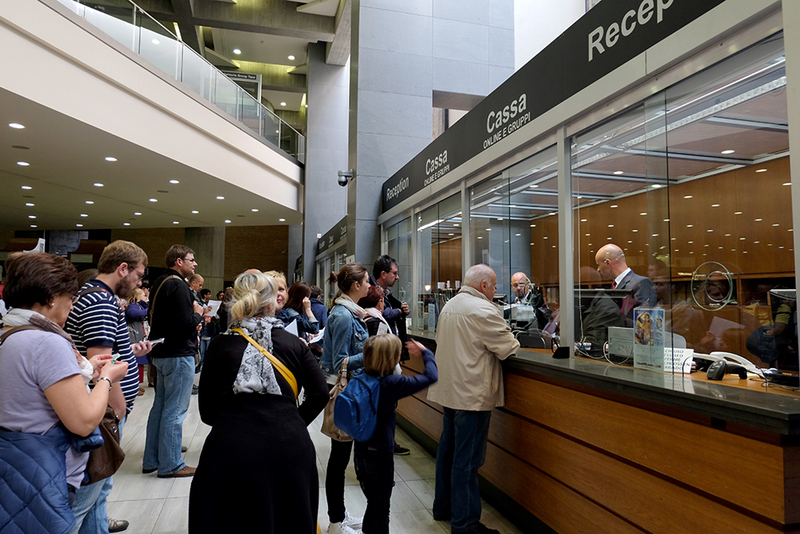 The easiest and fastest way to get inside the Vatican Museum is to purchase an individual ticket or group tour ticket online, either of which will enable you to bypass the ticket line completely. Just a little disclaimer though, this tour literally flooded my mind with tons of information so I will try my best to keep this entry short or at least give details on every photo posted. 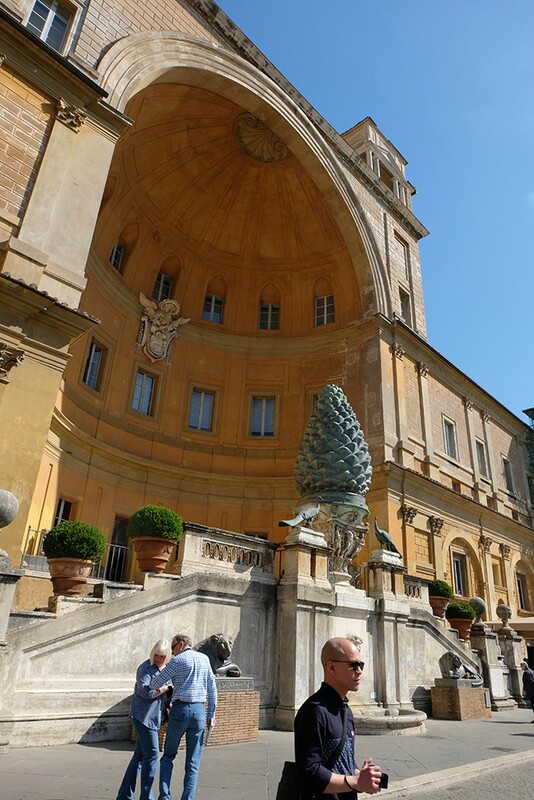 The Cortile della Pigna (commonly known as the pine cone courtyard) is just 1/3 of courtyards inside the Vatican. The Pigna (bronze pine cone on the right) originally stood near the Pantheon next to the Temple of Isis. It was moved to the courtyard during the Middle Ages and then moved again, in 1608, to its present location. The bronze peacocks on either side of the fountain are copies of those decorating the tomb of the Emperor Hadrian, now the Castel Sant'Angelo. 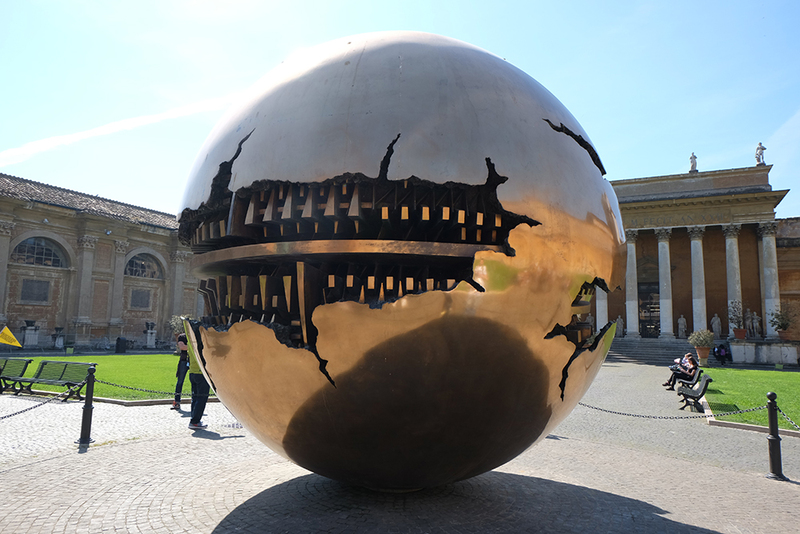 In the middle of the wide-open space are two concentric spheres called Sfera con Sfera (Sphere within a sphere) by Italian sculptor Arnaldo Pomodoro (1990). 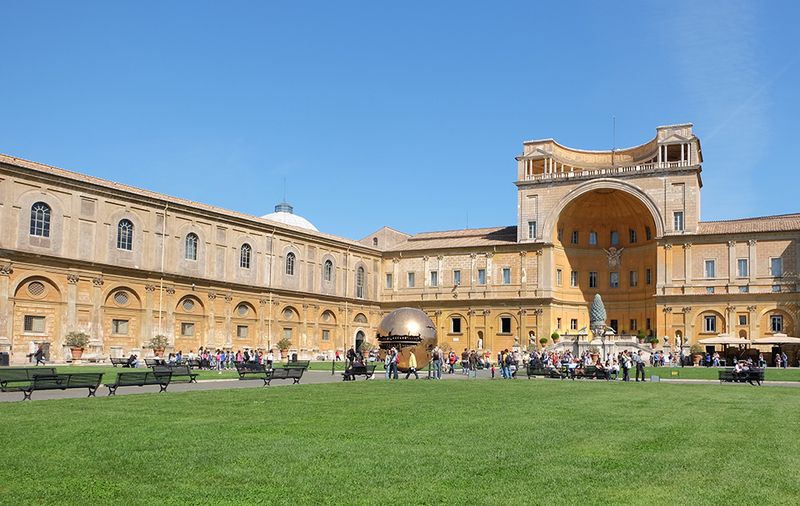 According to Vatican.com, the statue depicts a huge fractured orb. Inside the cracked orb you can see another one. Each tremendous sphere is broken, showing yet another cracking sphere. The design of the internal layers seems to imitate the gears or cogwheels of a complex machine such as a clock. It symbolizes the fragility and complexity of the world. Very The Da Vinci Code! Btw, we loved the spring weather. Here's our sister OOTD. Going back to our guided tour of the museum, our next location was the Gallery of Tapestries. 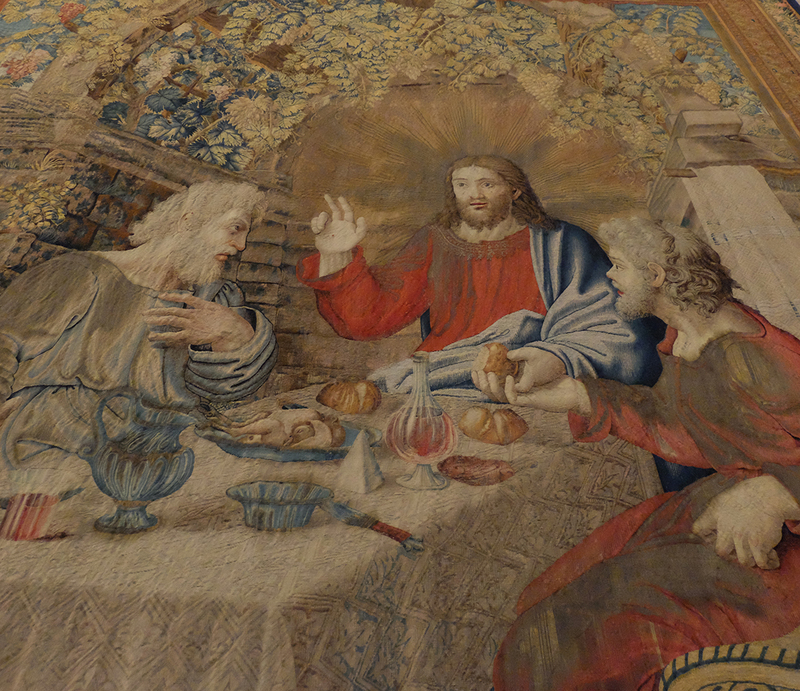 The gallery is 75 meters long and has two sets of tapestries; one showing gospel scenes from the life of Jesus done by Raphael's students the other set are scenes from the life of Pope Urban VIII Barberini. According to the gospel of Luke 24: 13-35, Jesus appeared to two Emmaus disciples after his resurrection. This is one of the many tapestries on the life of Christ produced by the workshop of Pieter van Aelst in Brussels (1524-31) based on drawings from the Rafeal workshop. The next room is the 120 meter long Gallery of Geographical Maps. It contains a series of painted topographical maps of Italy based on drawings by friar and geographer Ignazio Danti (Renaissance Art). 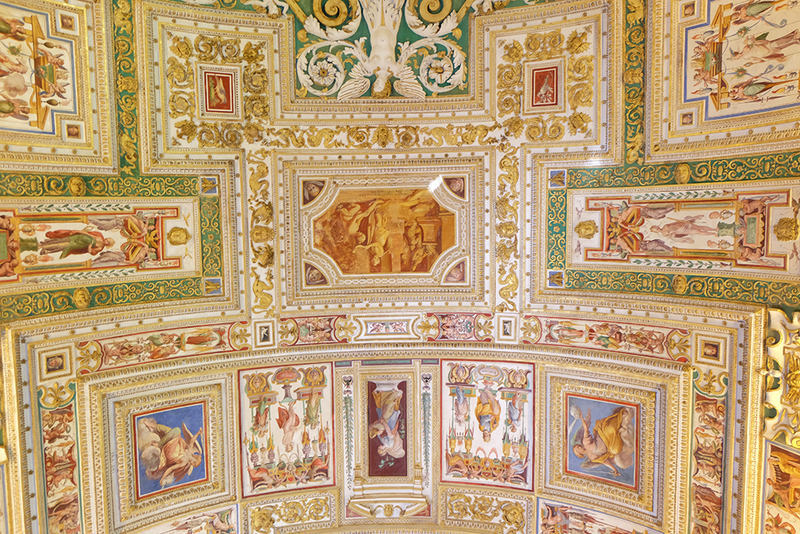 The decorations on the vaulted ceiling (which has got to be the most beautiful ceilings I have ever seen in my entire life) are the work of a group of Mannerist artists including Cesare Nebbia and Girolamo Muziano. The last stop and probably highlight of our Vatican Museum tour would have to be the time we went inside the Sistine Chapel. 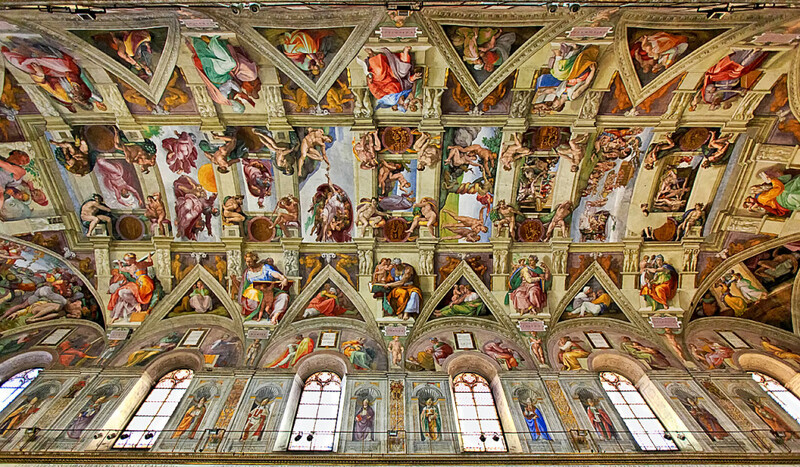 The Sistine Chapel is famous for its interior Fresco paintings by Italian Renaissance master Michelangelo. The chapel has served as a place of both religious and functionary papal activity. 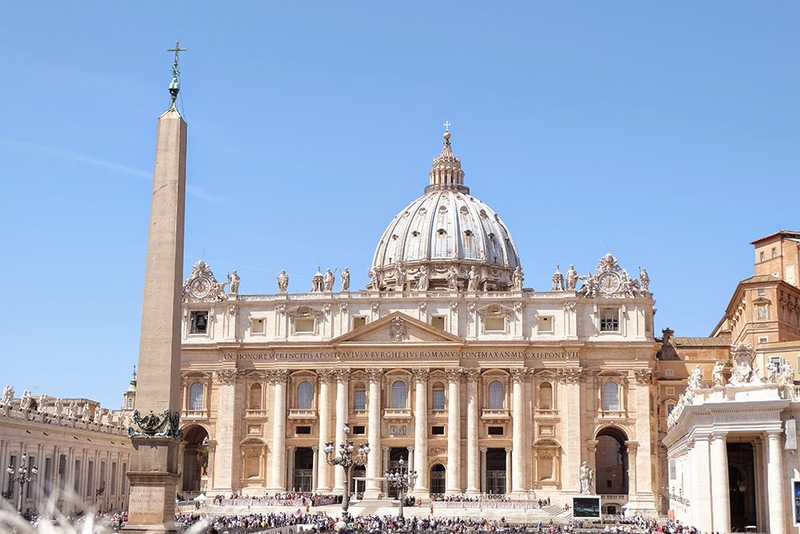 Today it is the site of the Papal conclave, the process by which a new pope is selected. Photos were strictly not allowed so I just grabbed this from Travelify. In the center part of the ceiling you'll see nine scenes from the book of Genesis of wherein the Creation of Adam is best known for. Photo grabbed from AcesWeeklyBlog. 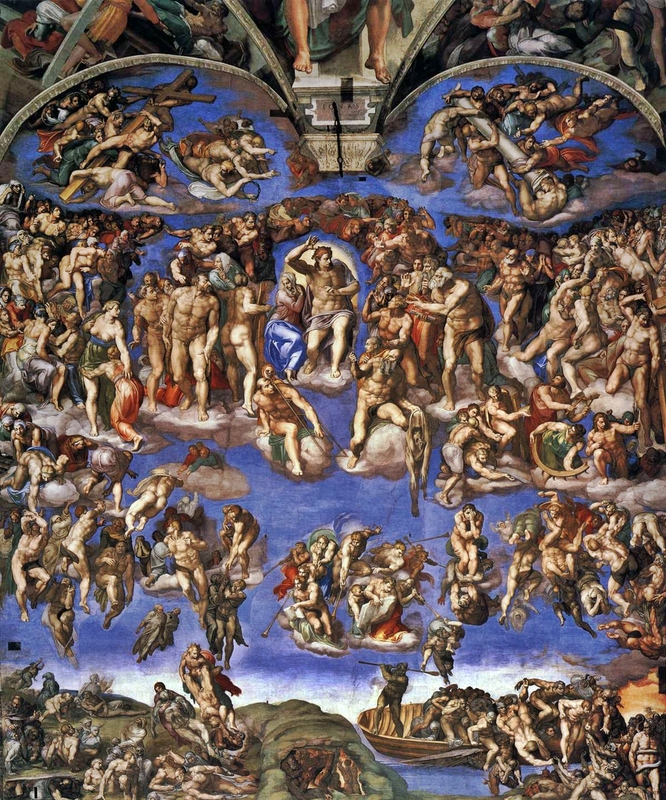 The Last Judgement is a depiction of the Second Coming of Christ and the final and eternal judgment by God of all humanity. Before leaving the museum, visitors get a glimpse or pass by the spiral staircase designed and built by Giuseppe Momo (1932). 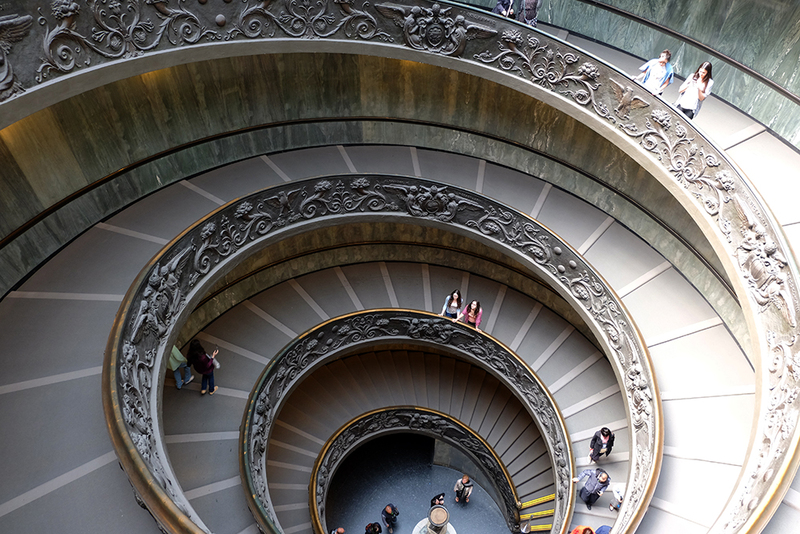 It is made up of two wrought iron stairways – one going up, one going down – that curve in a double helix. Ironically it was created in a time before the double helix became a symbol for science, DNA and subsequently, all human life. Our last stop for the tour is St. Peter's Basilica where we missed the Pope's Apostolic Blessing. 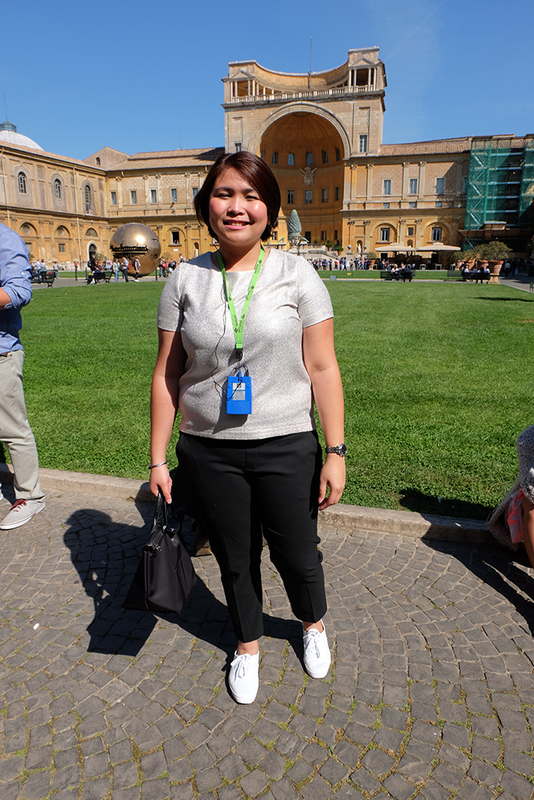 The Pope regularly holds Audiences every Wednesday (we were at the Vatican last April 22, sayang di naabutan si Pope Francis) where he greets the crowd in different languages, etc. The event usually lasts for 15-20 minutes. 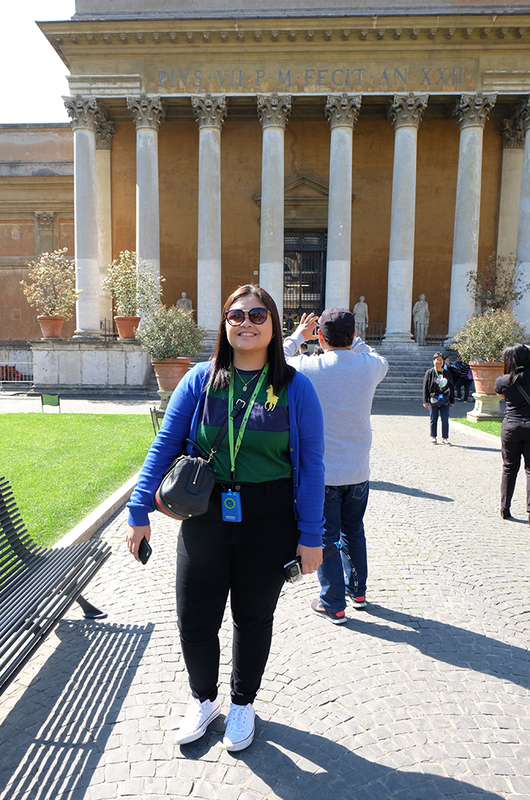 Anyway, we weren't able to enter St. Peter's Basilica because the Pope was inside and security could get pretty strict specially when He's around. 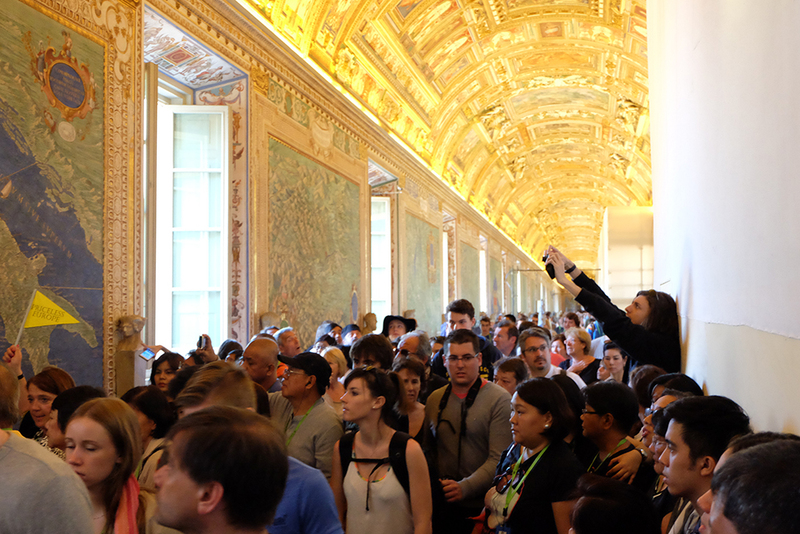 Anyway.. according to the official Vatican website, half day guided tours costs €32 per pax. We didn't have to pay for additional, it's already paid for by Rakso's counterpart in Europe.